After EU Parliamentary elections in late May, many people were concerned (or jubilant, depending on the circles you run in) about gains by anti-EU “Euroskeptic” parties. These parties did not gain enough seats to dictate policy, but they did gain a platform to push their agenda in future policy decisions. For every action, their is a reaction. It seems that gains from anti-EU parties have refocused pro-European forces, forcing them to adopt more “people-friendly” policies to counter the depression level unemployment rates (which have hit young people particularly hard). As any development economist will tell you, youth unemployment presents many unique problems, both individual (high depression rates, future income losses “wage scaring”) and societal (increases in criminal / anti social behavior, drags on economic growth). Systematic under-investment in young people is short sighted economically and causes untold human suffering. Such under-investment, while always reprehensible, is not surprising in the worlds least developed countries (LDCs), but this is Europe we’re talking about here. Europe’s leaders have responded with pragmatic policies in recent months (finally, it only took 5+ years!). In Early June, the European Central Bank took the unprecedented step of introducing negative interest rates for keeping deposits in the ECB, a policy likely to not be popular with people who have wealth to invest, but which nonetheless should help spark short-term economic growth. Jean-Claude Juncker won a wide endorsement from the European Parliament on Tuesday to be the next head of the executive European Commission after setting out a “grand coalition” investment programme to help revive Europe’s economy. Belying his reputation as a grey back-room fixer, Juncker spoke with passion of his ambition to “reindustrialise” Europe and put the European Union’s 25 million unemployed, many of them young, back into work. He promised a 300-billion-euro ($409-billion) public-private investment programme over the next three years, combining existing and perhaps augmented resources from the EU budget and the European Investment Bank with private sector funds, to build energy, transport and broadband networks and industry clusters. “We need a reindustrialisation of Europe,” the 59-year-old former Luxembourg prime minister said. He won support from the Socialists and Liberals as well as his own centre-right bloc, the largest in the EU legislature. Juncker acknowledged many Europeans had lost confidence in the EU and said only economic results and full employment, not endless debate over EU institutions, would restore their trust. …his emphasis on public investment, reaffirmation of a target of raising industry to 20 percent of EU economic output and call for a minimum wage in each EU country, were designed to appeal to the left. In a speech delivered in French, German and English, Juncker sought to reassure Germany and other north European fiscal hawks that the 28-nation bloc’s strict rules on budget deficits and debt reduction would be maintained. Juncker said euro zone countries should get financial incentives if they make ambitious structural economic reforms, funded by the creation of a separate budget for the 18 countries in the currency area. He also vowed to protect public services in Europe from what he called “the whims of the age” – an apparent reference to privatisation and restrictions on state aid. Europe’s stimulus act will not be a panacea. By all accounts, EU countries (with the exception of Germany) have recovered much more slowly from The Great Recession than the U.S. Unemployment remains too high, and is especially troubling in certain countries and demographics. Compounding the problem, this stimulus budget is too small to adequately address the problems facing the EU. The American Reinvestment and Recovery Act (ARRA) was less effective than imagined largely because it wasn’t big enough, and it’s funds came in at almost twice as much as its European Counterpart ($831 billion vs. $490 billion). However, only 2/3 of the ARRA was in the form of spending, while the remainder took the form of tax breaks (which, in the context in which it was passed, had a much lower “fiscal multiplier” than direct spending). The European program seems to be more spending focused, meaning dollar for dollar (or euro for euro) this smaller stimulus plan may go further in addressing the social and economic problems facing the EU. The EU plan also leverages public funds to stimulate private investment–Europe’s leaders are doing what they can given budgetary constraints barring a larger stimulus program. Combined with the ECB’s negative interest rates, EU leadership is proving it has moved past “bleeding the patient” and is taking a more proactive approach to economic recovery. I know it is hard to get excited about European leadership learning lessons after 5+ years of policy failure, but better incomplete and late than never, right? Sometimes you have to cut off the limb to save the patient. For the euro zone to survive, closer fiscal, taxation, and regulatory integration are needed. If Britain or any other country cannot accept this reality, they must seriously questions their future position within the EU (which, it seems, Britain will do with a membership referendum next year). Leaving the EU need not be marked with retaliatory economic barriers or deteriorating political relationships; it could be done in a way that largely preserves existing interdependence while opening avenues for greater policy flexibility. As no country has ever left the EU, the punitive impacts of such a move are undecided. Like any breakup, it could be ugly and painful, or it could be clean and leave the possibility of “remaining friends”. Categories: Blog Posts, Economic Outlook | Tags: ECB, EU, European Debt Crisis, European Parliament, euroskeptic, Eurozone, Great Recession, Stimulus, unemployment, youth unemployment | Permalink. In the aftermath of the global economic crisis, more than 70 per cent of the world population is without proper social protections, the United Nations labour agency today reported, urging governments to scale up investment in child and family benefits, pensions and other public expenditures. “The global community agreed in 1948 that social security and health care for children, working age people who face unemployment or injury and older persons are a universal human right,” said Sandra Polaski, Deputy Director-General of the International Labour Organization (ILO). As many as 122 governments are contracting public expenditures in 2014, of which 82 are developing countries, according to the findings of the World Social Protection Report 2014/15: Building economic recovery, inclusive development and social justice. “The case for social protection is even more compelling in these times of economic uncertainty, low growth and increased inequality,” Ms. Polaski added, noting that it is also an issue that the international community should embrace prominently in the development agenda following the Millennium Development Goals deadline in 2015. At the beginning of the 2008-2009 economic crisis, at least 48 high- and middle-income countries put in place stimulus packages totalling $2.4 trillion that devoted roughly a quarter to social protection measures. But from 2010 onwards, many governments reversed course and embarked prematurely on fiscal consolidation, despite the urgent need to continue supporting vulnerable populations and stabilizing consumption. In the European Union, cuts in social protection have already contributed to increases in poverty which now affect 123 million people or 24 per cent of the population, many of whom are children, women, older persons and persons with disabilities, the ILO reported. The report also shows that about 39 per cent of the world population lacks any affiliation to a health system or scheme. The number reaches more than 90 per cent in low-income countries. The report also highlights the cases of Thailand and South Africa, which have achieved universal health coverage in just a few years, showing that it can be done. “It is now a matter of political will to make it a reality. Modern society can afford to provide social protection,” Ms. Polaski stated. The Macroeconomic implications of premature austerity are fairly straightforward. Keynesian national income accounting tells us that insufficient private demand can be compensated for with increased public spending (Y = C + I + G + M-X). For the world as a whole, net exports (X-M) are, by definition, 0. Therefore, when global private demand (consumption, “C”) goes down, it can be compensated for by only be increasing stimulus spending (or cutting taxes, but the economic multiplier of tax cuts is lower than for stimulus spending, especially in a liquidity trap when even near zero interest rates are insufficient to stimulate private demand to full employment levels). If C and G are both insufficiently low, we get dangerously close to deflation–something almost every modernized economy is aggressively trying to avoid at the moment. High levels of debt and deflation causes a vicious economic cycle, where government spending cuts results in a higher level of “real” debt (even though the gross number associated with debt is reduced, the real value of that debt–what it can buy–goes up). This is one of the things that made the Great Depression so painful for so many people; as the programs that would have helped them were cut, the countries fiscal position worsened, leading to further cuts. It is the effect on people, on human development, that we truly care about here at Normative Narratives. In the context of high unemployment, one could see how cutting welfare programs, government jobs, etc. could be particularly painful on already vulnerable groups. I would need to conduct more in depth analysis of specific cuts in specific countries to speak on exactly how these cuts have negatively impacted people. The report highlights high unemployment and lack of access to healthcare as specific impacts of premature austerity movements. One human rights violation opens the way for others, often resulting in [extreme] poverty. For example, without access to safe drinking water or sanitation services, people become sick. Lack of access to healthcare can cause a person to lose their job. Lack of access to a quality job means a person is reliant on personal savings (which poor people tend not to have) and welfare programs (which, remember, are being cut). A shock or crisis that may result in a minor inconvenience for someone whose human rights are fulfilled can be catastrophic for those less fortunate. In Europe, the combination of high unemployment and austerity is resulting in a “lost generation” of potential, and that’s Europe! In places with extreme poverty, weak financial institutions, and unresponsive governance, the human costs of premature austerity are naturally greater. While I think a basic income guarantee is probably fiscally unsustainable (and in a country like the U.S., politically impossible), I do strongly believe in government job guarantee programs. Anyone who is willing to work hard to make their community / city / state / country a better place should be able to make an honest living doing so (just as anybody who is willing to defend U.S. national security can get a job in the military). Of course this would require greater levels of taxation and public spending, not less. The combination of corporate income tax minimization (from “inversion“, off-shore tax dodging, and government subsidies / tax breaks / and other loopholes in tax codes) and companies forgoing workers for capital is unsustainable–companies are reaping record after tax profits while people suffer without having their basic rights fulfilled. As a result, tax reform and guaranteed public employment must figure more prominently in future political economy debates and policies. Categories: Blog Posts, Economic Outlook | Tags: Austerity, human development, Human Rights, lost generation, poverty, social protection, Stimulus, unemployment, welfare | Permalink. At its winter meeting in Washington, the RNC approved by voice vote a resolution in favor of abolishing the 2010 Foreign Account Tax Compliance Act (FATCA), set to take effect in July, marking the party’s first explicit attack on the law. FATCA will require most foreign banks and investment funds to report to the U.S. Internal Revenue Service information about U.S. customers’ accounts worth $50,000 or more. The law was enacted after a scandal involving Americans hiding assets in Swiss bank accounts to dodge U.S. taxes. Critics have blasted the law as an unfair government overreach and invasion of financial privacy. “The Republican National Committee … urges the U.S. Congress to repeal FATCA,” said the measure, staking out a campaign position ahead of 2014’s mid-term elections. Tax watchdog groups that support FATCA slammed the Republican vote. “It is mind-boggling that a major political party would even consider endorsing a resolution to facilitate tax evasion,” said Heather Lowe, director of government affairs at anti-graft watchdog group Global Financial Integrity. “Repealing the law would cripple the U.S. and global efforts to fight offshore tax evasion,” she said in a statement. The Center for Freedom and Prosperity, a group that advocates for lower taxes and financial privacy, praised the RNC vote. “The GOP’s adoption of FATCA repeal to its platform is a major victory for taxpayer privacy rights,” said the center’s Director of Government Affairs Brian Garst. Repeal is unlikely and the issue was not expected to resonate with average U.S. voters, said lobbyists on both ends of the political spectrum. But they said Republican opposition to the law could help the party raise campaign funds. It is certainly mind-boggling that a major political party would endorse such a view. And even if a repeal is unlikely, this issue should “resonate with the average U.S. voter”. In an era of constant budget-battling and debt-ceiling standoffs (the next one is right around the corner), where stimulus spending is unthinkable and welfare programs are constantly coming under attack (even though both are extremely important during an economic recovery), it is important for Americans to understand the main drivers of U.S. government debt. 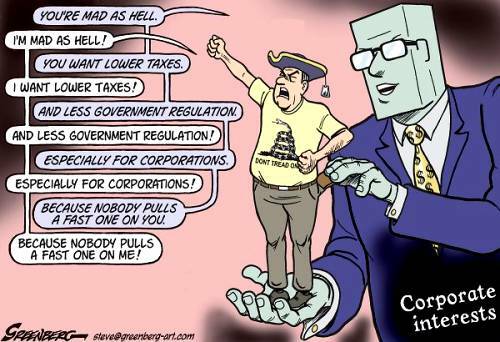 Once you understand these main drivers, it is obvious why this G.O.P. position on FATCA is unconscionable. A quick simplified lesson: There are two sides to government debt, receipts (tax revenue) and outlays (spending). While there are certain drivers of long-term spending which must be reformed (social security, and medicaid, and defense spending specifically), these long term issues have little to do with economic recovery fiscal policies (government stimulus spending and “automatic stabilizers“). A few historic graphs from the White House Office of Management and Budget (full tables from 1938-2012 can be downloaded: reciepts_endpenditure_history, reciepts_by_source) tell the story of U.S. government debt. 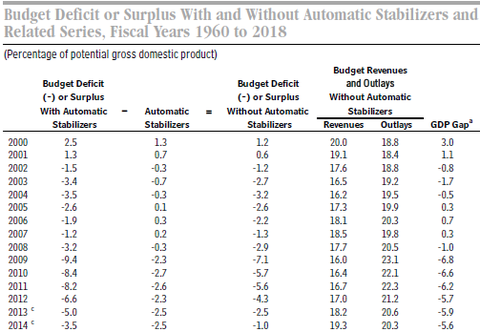 Government expenditures will go down when we experience full economic recovery (and not just a recovery for the top 1%)–that’s why welfare programs are known as “automatic stabilizers”. What will not automatically change are tax receipts, which are at their lowest levels since 1950. The American public has been paying a fairly constant portion of total federal taxes over the past 6 decades through income taxes–between 40-50%. Corporate taxes have fluctuated wildly; between 1940 and 1967 they made up 20-30% of federal tax revenue, since 1980 they have hovered around 10%. The American public continues to pay its fair share, while corporations get a pass (and actually get huge bailouts and subsidies). America, in reality, has a regressive tax system. This low effective corporate tax rate stems largely from tax loopholes; a difficult problem to address rooted in corporate lobbying (money buys influence buys loopholes). Overcoming this problem will take an overhaul of the government tax code and a change in the current lobbying system, neither of which is an easy task. Much less contentious should be targeting offshore cash holdings. While loopholes at least (allegedly) contribute to job creation, offshore tax evasion is a crime which robs the U.S. of vital tax revenues with no benefit to society. But even this “slam-dunk” reform is being challenged by the G.O.P. I thought it was interesting that the Center for Freedom and Prosperity, a conservative think-tank, used the privacy narrative to justify the G.O.P. stance on FACTA. This reminded me how Matt Taibbi, in his book “Griftopia”, explains how the wealthy sell financial sector deregulation to the lay-man. According to Taibbi, financial regulation is equated to local / state level government regulation–the average person, who experiences government overreach in their day-to-day lives, feels for the “poor banker trying to earn a buck”. Of course this equation is false; however, many people do not know enough about our political system to understand this fallacy, especially when their favorite news outlets are driving this false narrative home. It seems that something similar is being attempted with this privacy narrative. One of the main issues of the day is NSA “spying”. Perhaps conservatives are trying to latch onto this privacy narrative to drum up popular support for repealing FACTA. I think this is a tougher sell, although financial deregulation sounded like an impossible sell until pundits begin selling it. It is therefore important to expose this fallacy to the general public before the narrative hits the newsroom. Next time you hear an argument about “fiscal responsibility”, remember the G.O.P is the party of offshore tax evasion. Social spending programs and the tax code need to be overhauled; these issues will take time to remedy and must be addressed with care, they cannot be attached to short term issues like economic recovery or the debt ceiling. Enabling offshore tax evasion by repealing FACTA benefits nobody except those who engage in offshore tax evasion–this should not be a contentious issue. Those who engage in such activities do not deserve our understanding or support, regardless of your stance on NSA surveillance. Categories: Blog Posts, Transparency Report | Tags: automatic stabilizers, debt, deficit, Democrat, FATCA, financial accountability, griftopia, matt taibbi, NSA, offshore banking, recovery, Republican, Snowden, Stimulus, tax evasion | Permalink. “Officials backed an action plan to boost jobs and growth, while rebalancing global demand and debt, that will be readied for a G20 leaders summit hosted by President Vladimir Putin in September. “Sources at the meeting said Germany was less assertive than previously over commitments to reduce borrowing to follow on from a deal struck in Toronto in 2010, with the improving U.S. economy adding weight to Washington’s call to focus on growth. “The G20 accounts for 90 percent of the world economy and two-thirds of its population – many living in the large emerging economies at greatest risk of a reversal of capital inflows that have been one of the side effects of the Fed stimulus. “The International Monetary Fund warned that turbulence on global markets could deepen, while growth could be lower than expected due to stagnation in the euro zone and slowdown risks in the developing world. Yesterday I discussed the coordinating role groups such as the G20 play in today’s globalized economy. That post focused specifically on coordinating efforts to curb corporate tax-evasion. Today’s article emphasizes that fiscal and monetary policies must also be coordinated in order to achieve sustainable human development on a global scale. Fiscal stimulus efforts must be coordinated; if they are not, the benefits of an individual countries stimulus programs will not be fully realized. Consider a hypothetical jobs program in the U.S. If this program is enacted unilaterally, then depressed demand in export markets (ex E.U.) will cause increased production capacity in the U.S. to lead not to greater trade but surplus goods and lower prices–employment gains will not be sustained by the private sector and will likely be reversed once stimulus money runs out. However, if fiscal stimulus programs were coordinated, and both the U.S. and the E.U. increased productive capacity and income, then a basis for trade and self-sustaining growth could emerge, making fiscal stimulus a short-term “shot in the arm” (as it is intended to be) instead of a permanent program (which is not sustainable for governments and often leads to uncompetitive industries). Monetary policy must also be coordinated. Quantitative Easing by the U.S. Federal Reserve and the Bank of Japan have injected cheap money into the global economy. Seeking higher returns, this cheap money is often channeled towards emerging markets (such as the “BRICS”). One fear is that once QE policies wind down, emerging markets will experience “capital flight” as higher returns become available in more stable markets. In order to temper this inevitable effect of monetary tightening, both monetary policy coordination and “forward guidance” are needed from major central banks. Bernanke recently reasserted that the Fed will continue bond-buying until U.S. unemployment drops to 6.5% or inflation rises to 2.5%. However, this forward guidance is slightly muddled by ideological differences within the Fed, and amplified by Bernanke’s presumed exit as chairman of the Fed early in 2014. Coordinated monetary policy can provide the clarity needed to assuage markets. In a surprise move a few weeks ago, ECB head Mario Draghi “promised rates will remain ‘at present or lower levels for an extended period of time.’” Indications that the ECB and BoJ are committed to providing liquidity to global markets will make the Feds (eventual and inevitable) retreat from QE less damaging to global markets. About a month ago, I discussed the impacts of austerity programs on states human rights obligations. This post focused a study Spanish austerity and healthcare. The G20 is more concerned with global issues (although Spain and Greece are still a poster children for youth unemployment and the social deterioration that austerity can cause during a recession, and are therefore common examples for pro-stimulus / anti-austerity proponents). 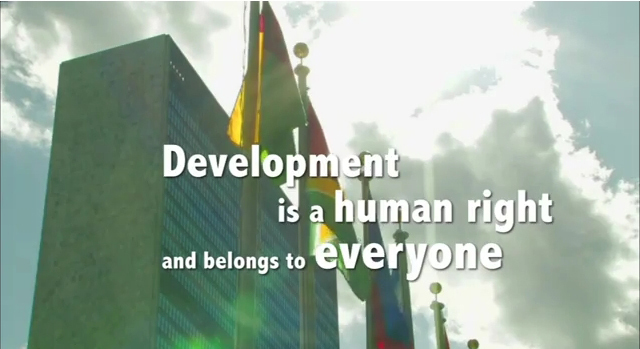 One essential element of the right to development is the international recognized “right to work”. Article 23 of the Universal Declaration of Human Rights states, “Everyone has the right to work, to free choice of employment, to just and favourable conditions of work and to protection against unemployment.” This right is a particularly important aspect of the right to development, as work income provides a means of self-determination and the ability reduce dependence on welfare programs as people attempt to realize their personal goals and aspirations. Sometimes people do not work because they are lazy, or suffer from physical or mental conditions which impede their ability to find or maintain work. 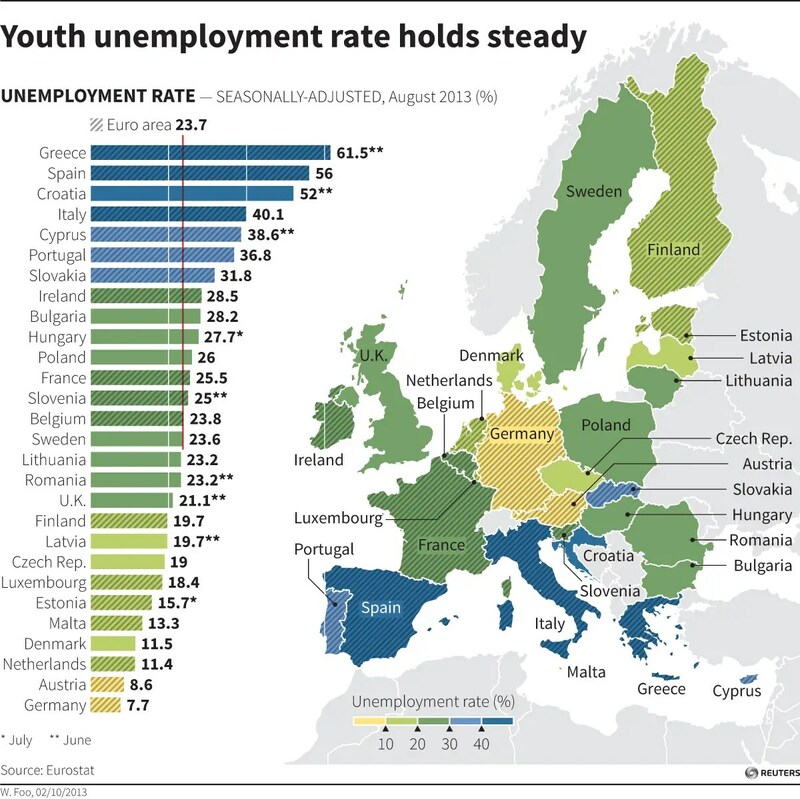 However, when unemployment rates are above 20%, and youth unemployment is above 50%, this can hardly be attributed to laziness (unless you think the world’s lazy people are all collaborating and putting themselves through years of misery in order to remain lazy, but that argument is absurd hard to sell). Such high unemployment levels are due in large part to government inaction / inability to pass stimulus programs, and the negative effects of austerity programs in the face of inadequate private sector demand / personal consumption (this is not stipulation or a normative stance, but rather what textbook economics tells us). Such high levels of unemployment represent a failure of states to uphold the universal human “right to work”, which undermines the internationally recognized “right to development”. For years now, economic policy has been dominated by politics and vested interests. It is heartening to see national labor and finance ministers finally coming together to “eliminate obstacles to development”. More concrete programs will probably hopefully be hammered out when heads of state come together in Moscow in September for the G20 leaders summit. I hope this is not “too little too late”, and that the years since the Great Recession took hold have not lead to “lost generations” of young people who are doomed to a lifetime of anti-social, unproductive, and sometimes criminal behavior (as some people have argued). While there will inevitably be some lifetime dependents resulting from the Great Recession (as there always are from traumatic experiences, be they economic downturns, natural disasters or violent conflicts), I am optimistic that as a whole young adults and the unemployed in general are eager to get back to work once the global policy coherence needed to create those jobs is established. G20 meetings this past week represent a meaningful step in that direction. Categories: Blog Posts, Economic Outlook | Tags: Austerity, G20, Great Recession, Human Rights, lost generation, right to development, right to work, Stimulus, sustainable human development, UN, UNDP, unemployment, universal declaration of human rights, youth unemployment | Permalink. Japanese economic policy, named “Abeconomics” after Japan’s Prime Minister Shinzo Abe, offers a natural experiment from which the U.S. can draw lessons. There is a much more obvious natural experiment for the U.S., which is U.S. economic policy, but those against “Quantitative Easing” are never short on reasons for why QE hasn’t debased the dollar / led to soaring interest rates on U.S. bonds (but soon will ahhtheskyisfallingmoralhazard!!!!!). Perhaps Japan’s experience, which is further removed from the U.S., can allow us to be more objective in our analysis. The basis for expansionary monetary policy is due to “liquidity trap” macroeconomics. When the Fed cut’s interest rates near zero, non-traditional means of using monetary policy are the only policy choice left to stimulate aggregate demand and reduce unemployment (as far as monetary policy goes, fiscal policy is another story to be addressed shortly). “Normally a weakening exchange rate might be taken as a sign of decline. The yen has fallen nearly 14 percent against the dollar this year, and no currency has fallen more except the Venezuelan bolívar. The U.S. probably benefit from a slightly weaker dollar, making exports more competitive which could help revive U.S. manufacturing and renewable energy industries (among others). I believe the USD role as primary international reserve currency (60% of international holdings) are keeping the dollar strong despite QE. Foreign holders do not want to see the value of their reserves go down, so the dollar continues to be the safe-haven for investments despite unprecedented monetary stimulus. How effective have these policies been? U.S. unemployment has dropped to 7.5%, although underemployment and people dropping out of the labor market may be producing a rate that doesn’t capture the stagnation in the job market in the U.S. Japanese unemployment sits at 4.1%, a rate that for the U.S. would currently constitute an economic pipe-dream. Japan certainly has its issues, but it is not letting doomsayers dictate its economic policy. Despite much higher gross government debt to GDP (Japan has roughly 235% debt to GDP ratio, while the U.S. is at about 107%) Japan is pursuing fiscal stimulus. Abeconomics includes a 2-2.5% of GDP stimulus plan for Japan. Compare that with the fiscal contraction in the U.S. So the U.S. and Japanese economic policies give us a natural experiment. Both are advanced countries with highly skilled labor forces and strong financial markets. Both are pursuing monetary expansion. One of the countries, despite a much higher debt-to-GDP ratio, is also pursuing fiscal stimulus, while the other is pursuing fiscal contraction. Granted Japan went through years if not decades of stagnant growth before flipping the script to “Abeconomics”. The U.S. is “only” 5 years removed from the Great Recession. Do we really need to wait decades before we pursue policy that we know will stimulate the economy and reduce unemployment / the output gap? As Keynes said, “In the long run, we’re all dead”. It is not enough to say give it time and things will get better. Peoples skills and confidence in their abilities are deteriorating in the U.S.. The output gap is large and growing, and spending on safety-net policies will not decrease until unemployment goes down (hence “automatic stabilizers”). Hopefully Japan’s successes will inspire confidence in fiscal stimulus; if a country with twice as high of a debt-to-GDP ratio (and an unemployment rate almost half as low) can benefit from fiscal stimulus, surely the U.S. can as well. Categories: Blog Posts, Economic Outlook | Tags: Austerity, Bank of Japan, BoJ, Federal Reserve, Fiscal policy, Japan, keynes, Monetary policy, output gap, Quantitative Easing, Stimulus, US | Permalink. Paul Krugman does a nice job of explaining why unprecedented monetary expansion (“quantitative easing”) has not really moved the needle in terms of reducing unemployment and increasing aggregate demand. It would be prudent to remind the reader that there has been very little counterfactual analysis of the Feds policies since the Great Recession began (that I am aware of). The situation would almost certainly be worse, higher unemployment and deflation, had the Fed failed to act in the way it is. If you would like to read further on the downward spiral of debt, austerity and deflation in a depressed economy, Irving Fischer wrote on the subject following the Great Depression in a way that is both easy to understand and still as relevant today (perhaps even more-so given how much less politically charged expansionary monetary policy is post-gold standard). A liquidity trap is a situation when slashing interest rates on government bonds to near zero percent is insufficient to provide enough credit to allow the economy to produce at full productive capacity. Investors would rather invest in safe government assets with almost no yield then invest in private markets. I believe a liquidity trap is in itself justification for expansionary fiscal policy. It is basically investors saying to the government, “here, we don’t want to invest our money, so do it for us and just promise to pay us back in the future, don’t even worry about the interest”. But fiscal policy, which originates in the House of Representatives, is politically charged (especially when a government is already highly indebted, then every spending program comes under close scrutiny). Monetary policy, on the other hand, is much more politically isolated. It originates within the Federal Reserve, which is staffed with economists who understand economics better than politicians. The Fed began by cutting rates, hoping to stimulate aggregate demand. Once this conventional monetary policy failed, unconventional means were taken; the Fed is buying assets on a large scale, expanding the monetary base. The Fed has pledged to continue to pursue expansionary monetary policy by buying assets on a monthly basis until either the unemployment rate falls below a certain level (I believe 6.5%) or inflation rises above a certain level (I believe 2%). The Fed made this announcement to try to change people’s expectations. Since you cannot cut nominal interest rates below zero percent (the “Zero Lower Bound”), the Fed hopes to stimulate demand by making people think that in the future inflation will be higher than it is now. If money is worth less in the future, then people will want to spend it now while it is worth more. More spending stimulates the economy and reduces unemployment. So why has this policy been ineffective? Well, as I said before, I am not so sure it has been—certainly the situation would be worse right now, not only for America but for the rest of the world which overwhelmingly relies on dollars for international transactions. “I’m not claiming that there is nothing the central bank can do; but as I’ve tried to explain before, monetary policy can, for the most part, gain traction under current circumstances only by changing expectations about future actions (and changing them a lot). Meanwhile, fiscal policy has a direct, current effect on the economy, which easily trumps attempts to move the economy by changing the Fed’s messaging. Think of beginners national income accounting, where aggregate demand (Y) = C (consumption) + I (investment) + G (government spending). Fiscal policy can stimulate AD directly by increasing either G, C, or I depending on how the program is designed. Monetary Policy, on the other hand, has a much less direct effect. It tries to incentivize people to act a certain way (increase C or I), but people do not always act “rationally” in the economic sense. Sometimes people are so risk averse that even reducing the yield on an investment does not reduce the demand for this investment (particularly in times of economic uncertainty, when I would argue investors tend to become more risk averse). Also, there is inherently less scrutiny in exactly how monetary policy works. While it is true that some portion of fiscal expansion may be used inefficiently, it is much more tractable than monetary policy. Monetary policy stimulates AD, but it can also feed into financial bubbles. By providing low interest loans to banks, the Fed is making a leap of faith that the money will be spent wisely. The money should be going to helping people restructure underwater mortgages, or generally providing low cost financing, freeing money for people to spend and stimulate demand. And to a certain extent it is does, but it can just as easily be spent in other less egalitarian ways. If this money goes to Wall St. investments, the gains will be realized almost entirely by the wealthy. Evidence exists that this is happening—unemployment remains stuck while financial markets have reached record highs. Securitization, which became taboo after the financial crisis hit, has began to become common practice again. Without meaningful financial reform, the Feds policies could be fueling the next asset bubble. The Fed has maintained it is keeping a close watch on how its money is being spent, and given the suffering caused by the Great Recession I’m sure it is, but there is only so much it can do. The Fed cannot possibly micromanage how all of its “cheap money” is being spent. The Fed could try to only lend to more people-friendly institutions, such as “credit unions”, or establish mechanisms to lend directly to people and small businesses, but up until this point has either has not or cannot do so (either due to its mandate or due to insufficient manpower for such oversight). So expansionary monetary policy has kept the recovery from not being worse than it is (or not being a recovery at all), but it has predictably fallen short of its intended goal. It needs to be complimented by expansionary fiscal policy. That’s not to say that there are no inefficient programs that can be made to more efficient–there almost assuredly are. The stimulus-advocate policymaker should have concrete examples of how resources can be used more effectively, if he has any hopes of convincing his austerity minded counterpart of coming to an agreement. Policy, like markets, requires both competition and coordination to be made as efficient as possible. The Fed should not reverse course now, but should ensure proper oversight for its policies. 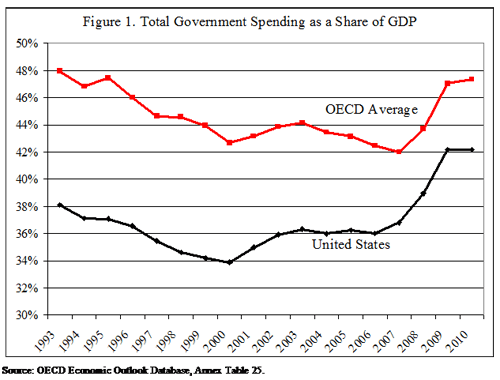 The Federal government, on the other hand, seems to be slowly moving from austerity to stimulus. Will common sense and text-book macroeconomics prevail, or will business as usual continue? Only time will tell. Categories: Blog Posts, Economic Outlook | Tags: Austerity, Expansionary monetary policy, Fed, Federal Reserve System, Fiscal policy, Great Depression, Monetary policy, Paul Krugman, Stimulus, United States | Permalink. Markets around the world reacted favorably to news of a deal reached by Congress Tuesday to avert the Fiscal Cliff. The deal reflects concessions from both sides, although is largely seen as a victory for Democrats, who secured most of the Bush-era tax cut expirations on the wealthiest Americans while preserving low rates of the middle class. 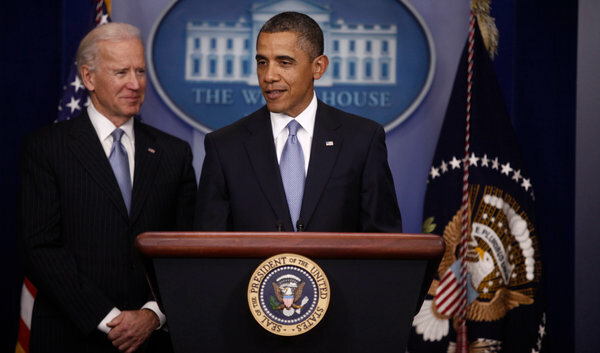 Obama also got the short term stimulus needed to help along the weak U.S. economic recovery, which he could not have gotten by “going over the cliff”. Neither side emerged too optimistic from the bargaining table, which probably reflects that a fair deal was reached (although don’t tell a happy VP Biden that). By raising the maximum threshold from $200,000 (single filer) and $250,000 (joint) to $400,000 and $450,000 respectively, the G.O.P. was able to spare the majority of small businesses that would have been affected by the expiration of the Bush era tax hikes. Lower rates for middle income earners and continued government spending are likely to benefit poorer voters, those who spend a larger % of their income and therefore stimulate the economy more for every dollar of income they have (compared to a wealthier person). Concessions and approval by the G.O.P. in the House of Representatives, the fiscal bills toughest opponent, can be seen as a means of gaining popularity among voters after tough losses in the 2012 election. The bill received wide bipartisan support in Senate, if the House failed to pass the bill the majority of the blame would’ve fallen on specifically on G.O.P House Representatives. Markets in Europe (and around the world) have also reacted favorably to positive news of greater fiscal consolidation and ECB action in addressing the European Debt Crisis. On the other hand, markets have reacted negatively to news of austerity preconditions for emergency debt financing and general pessimism over the sustainability of GIPSI (Greek, Irish, Portuguese, Spanish and Italian) debt. Check out Trading Economics global financial markets info (you will have to search each country individually unfortunately there does not seem to be a chart for market averages by region). Each peak and valley in recent history is likely to be associated with some government action or inaction, with too many to go through individually. Hopefully the G.O.P. will learn by positive reinforcement; markets reacting favorably will lead to a favorable response by their constituent. As with any political party, the G.O.P. is ultimately accountable to the will of the people. If this is the case, and the G.O.P. is willing to be more flexible on its position of short term stimulus spending, targeting long term deficit reduction in the form of higher taxation while addressing future spending cuts once the economy has fully recovered from the recession, then Obama’s concessions will be well worth it (and the G.O.P. will find itself with a much broader support base come 2014, and a much stronger platform to run on). If Congress uses the debt-ceiling, as it has stated in the past, to force contractionary spending cuts into the Federal Budget, then any goodwill generated by reaching a fiscal deal in Washington is likely to be short lived. The U.S. is out of the frying pan, but whether we are “into the fire” or “in the clear” is largely dependent, for better or for worse, on the future actions of our elected officials. Let’s hope the 113th congress is more responsive to the needs of the American people than the 112th was. Deals should not be made simply because markets will react a certain way, that’s bad politics and bad economics. Deals should be made with long term debt sustainability, short term economic recovery, and social equality / mobility as the ultimate goal. Special interests should not dictate policy that affects hundreds of millions of people nationally and billions of people worldwide. The “confidence fairy” is real, and policy does have both immediate and long term effects on markets and economic performance. It is not, however, “moral hazard”, or high levels of debt which drive the “confidence fairy” (especially not in the short run, which is the only place the confidence fairy exists anyways, as markets tend to forgive past mistakes very quickly in search of profitability, ask Argentina). It is government competency that has a real impact on the global economy. When governments act courageously, and work out strong bi-partisan deals that protect the interests of the majority and promote overall economic strength, markets react positively. When elected officials squabble like schoolchildren, and remain accountable only to fringe groups, nobody wins. The confidence fairy is more of a gauge of confidence in our political process then confidence in short term budget sustainability. When policy is perceived as sustainable, business flourishes and consumers are more confident, increasing growth and reducing unemployment. When uncertainty and partisanship are the order of the day, the economy stalls and everybody loses—even those who think they have “won”. Hopefully we have learned a collective lesson as a country and a global community from our past mistakes, only time will tell. Categories: Blog Posts, Economic Outlook | Tags: Austerity, Confidence fairy, FIscal cliff, fiscal deal, Stimulus, Tax Plan | Permalink.